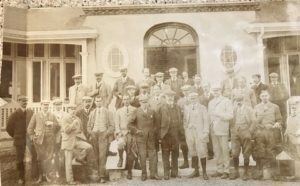 The first Annual General Meeting of Sunningdale Golf Club was held at the Café Monico in London on Thursday 29th March 1900. During 1899 two brothers, T.A. and G.A. Roberts built a house in Sunningdale called “Ridgemount”. 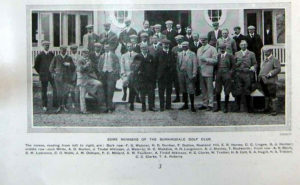 In one direction it faced what is now Sunningdale Ladies Golf Club and in the other the present entrance to the Club. The house on which it was constructed belonged to St. John’s College, Cambridge, which still owns a large estate in Sunningdale. T.A. Roberts approached St. John’s College with a view to making a golf course and to creating leaseholds on the adjoining land for quality houses. An agreement was soon reached with the college and a Founder’s Committee was formed with the Roberts brothers as promoters. A hundred keen golfers were soon found to subscribe for £100 bonds. A contract was signed with Willie Park Jnr. On 4th December 1899, for the construction of the course for a price of £3000. In February 1900, the first Club Committee was formed and it was resolved that the Club should be a Member’s Club.